The autographs of every U.S. President from Washington to Reagan. Oregon Trail diaries handwritten by nineteenth-century pioneers. Original glass-plate negatives of historic Native American portraits. Bill Bowerman’s letterman sweater and the game ball from the 1920 Rose Bowl. The manuscript of One Flew Over the Cuckoo’s Nest, straight from Ken Kesey’s typewriter. A folio of Shakespeare’s plays published in 1632. A limited-edition artist’s book printed and bound only weeks ago. What do these things have in common? They all share the same home. Featuring one-of-a-kind documents, rare volumes, original works of art, and more than a million photographs, the University of Oregon’s Special Collections and University Archives (SCUA) constitute an unparalleled record of Pacific Northwest history and culture—one of the largest such collections in our region. Now excellence, innovation, and first-rate leadership in stewarding this vital resource have been assured. The Giustina Forest Foundation has pledged $1 million to endow the Giustina Director of Special Collections and University Archives. In the upcoming months and in perpetuity, the gift ensures that the library will always be able to recruit and retain the strongest possible candidate to fill this essential leadership role. UO President Michael Schill, who is an avid book collector, said this gift will keep giving for generations. A key part of any research library’s holdings, special collections and archives are at once a source of knowledge about the past and the raw material for future scholarship. 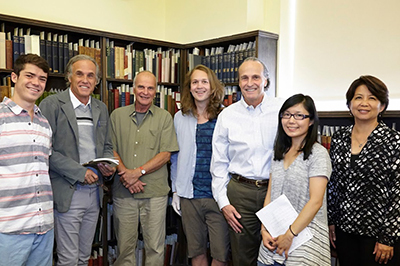 Spokesperson Dan Giustina ’72, MBA ’74, said that members of the Giustina Forest Foundation were “astounded” to learn about the depth and breadth of the UO Libraries’ archives. They were also quick to recognize the need for exceptional SCUA leadership. Dean Lim echoed his view that the new endowment would be long lasting and far reaching in its impact. Located on the second floor of Knight Library, the Special Collections and University Archives are open to the university community at regular hours during the school year and between terms.